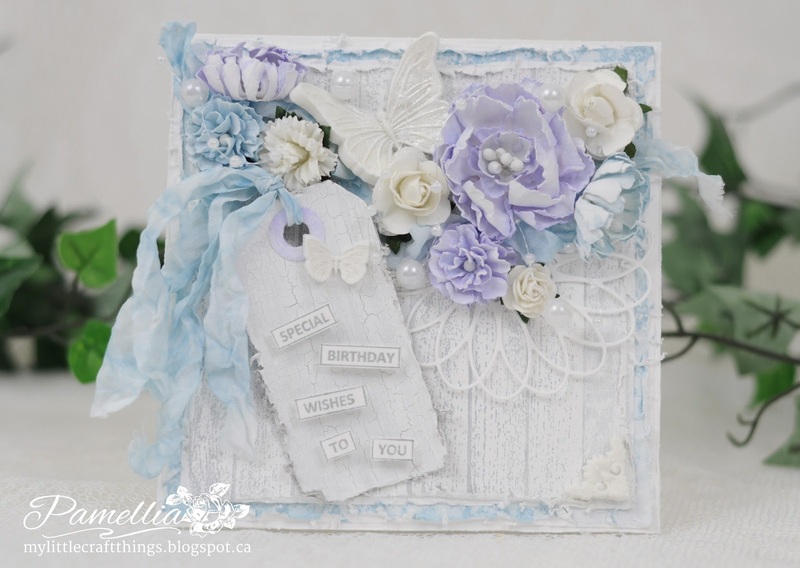 It's time for another challenge over at Crafty Cardmakers! Thank you to everyone who played with us last time, there were so many wonderful projects! What a feast for the eyes! I am hosting my first ever challenge (how exciting!) and I have chosen Challenge #124 - The Triple 'B' Challenge for my first time as hostess. You need to use at least 3 of the 5 options below on your project. Not 3 of the same thing, but 3 different things. You can use all five if you want, but not less than 3. The flowers are cut using Spellbinders Create-A-Carnation and coloured with Tim Holtz distress ink Dusty Concord and Hero Arts shadow ink Summer Sky. The purple was too dark for my taste so I made a wash with diluted DecoArt Titanium White paint and then coated all of the flowers to dull down the colour. The white roses are from Wild Orchid Crafts. The tag is cut from Tim Holtz Tiny Tabs and Tag. I used a crackle medium and grey and white paint to get the porcelain look on the background. The sentiment is from Heartfelt Creations All Seasons. The background was stamped using Hero Arts shadow ink London Fog and Impression Obsession Woodgrain background stamp. The doily is cut from a Memory Box Whimsy Circle die. 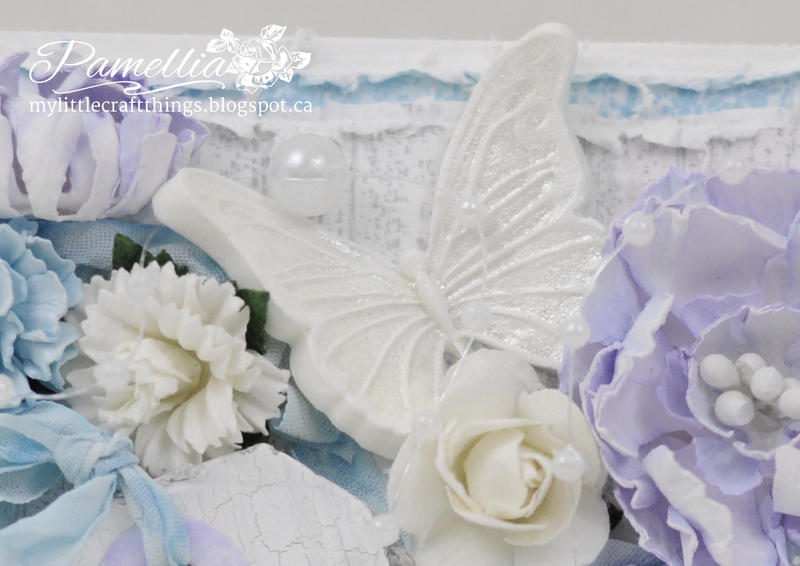 The butterflies and corner embellishment are made from Martha Stewart molds and polymer clay. I took some Ranger White Opal Perfect Pearls, watered it down and painted it on the butterflies for some subtle glitter. Another stunning creation. Your shades of blue all work seamlessly together and butterflies are so beautiful. Thanks for choosing such a good theme for this challenge. Sally D.x. I love when I start off my day with a feast for my eyes! Your heavenly creation is like a prescription: Take a look as needed! How exciting it is to be a challenge host for the first time! And you picked a fantastic theme! Love it! Let me go back to your card....With each project you make, I always wonder:"How is she going to top this one????" and every time I go back to check your blog and get my prescribed dose of heavenly beauty I see yet another creation that drops my jaw! I don;t even know where to begin to describe how much I love every single detail on this card! You are a genius! BRAVO! ...and thank you for always making a point to visit my blog and leave such heartwarming comments. I truly and greatly appreciate you! Such beautiful muted colours Pemellia, another stunner. Your first challenge is fun and the inspiration project beautiful as always.I love the colours.The soft purples and blues are so dreamy and lovely.Love the use of clay pieces and the beautifully crackled tag.You have to stop making such beautiful flowers.I just keep drooling over them and then I start searching and buying the dies you used.At this rate I will be broke soon and you shall be blamed....Just kidding. :-).I love your handmade flowers.You have a special touch.Lovely lovely lovely! Okay Pamellia...I'm running out of adjectives to describe just how wonderful your work is!! I think I may have to make up some new words...but today I'll stick with STUPENDOUS!!! And thanks for the lovely words on my blog...I'm trying really hard to get back to that craft room more!! This is so beautiful!! I especially love that tag ... 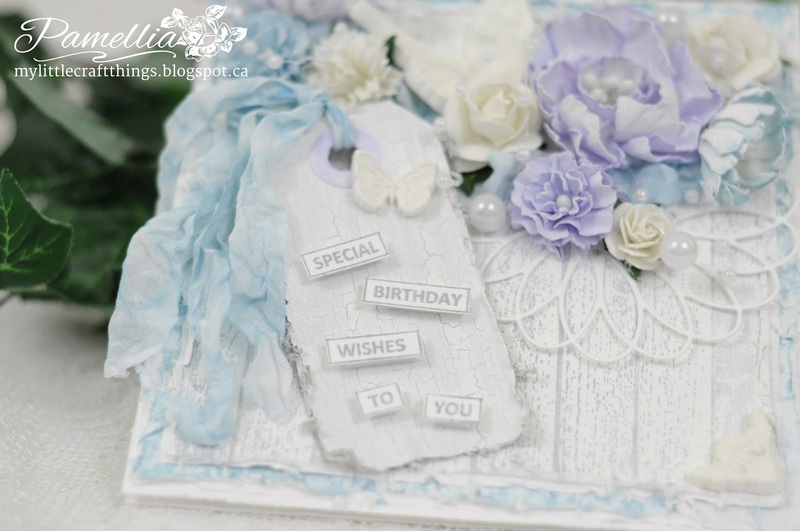 Your creations are always show stopper and it's a delight to visit your blog! This is a fiest for the eye, Pamellia. So dreamy soft and beautiful. Love! WoW! Congrats on hosting your first challenge...it's cool! Sad, I can't make cards,I get the jitters...Am so in awe of people who make cards and cards like these! Need I say, this is BEAUTIFUL Pamellia. The subtle colors and the crackle...just wow! Have a great week ahead. Hugs. This is absolutely gorgeous Pamellia! 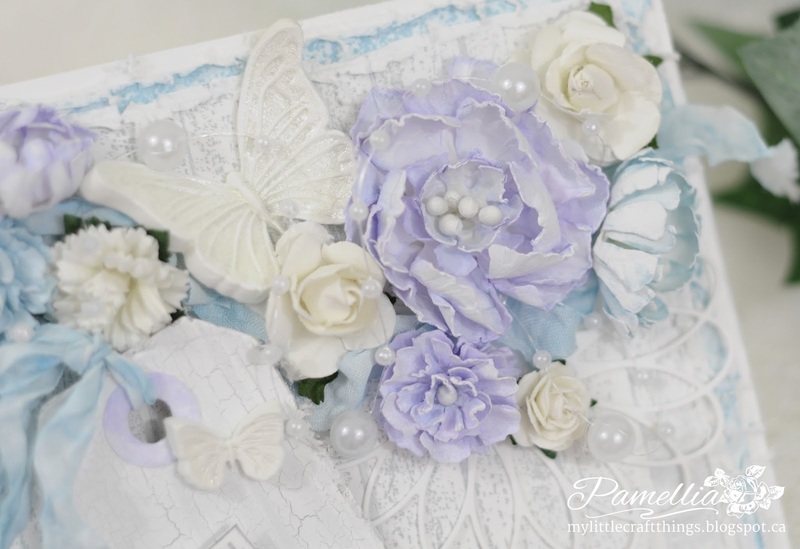 I love the soft colors and the beautiful butterflies, stunning flowers as always! Beautiful, (more) beautiful, (the most) beautiful. See, triple B. ;) He he. No, seriously, this card is breath taking. I know I say this for most of your creations, but I din't care. It's true. I think this one is my favourite so far (proably til you come out with a new one lol). I LOOOOOOOOOOOVE this one!!!!!! You my dear have out done yourself this is just adorable soooooooo pretty and so much detail I love it oh and I saw your tut for glitter texture paste and I have the urge to get messy again YOUR FAULT!!!!!!! Congratulations with your first hosting Pamellia and you have a wonderful card. Lovely details, very nice. I agree with all your other comments, this it another stunning creation! I love your pretty design, all your detailing is so beautiful and the delicate colours are gorgeous. I especially love the butterflies with the subtle shimmer effect. Wow Pamellia, another stunning design and the most beautiful flowers. Truly beautiful. Such a gorgeous card Pamellia, beautiful colours and lovely details. Good luck with your first hosting though I am sure you wont need it. A stunning card, the flowers look beautiful. B for Beautiful - Love it. 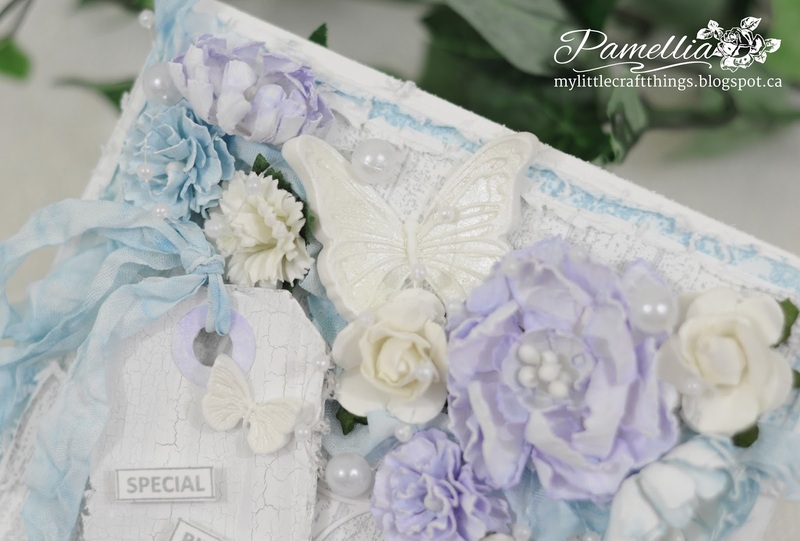 I was scrolling down my blog list a and came upon one of the loveliest creations I've ever seen, then I saw your name and realized it was another Pamellia masterpiece!! Your card is so gentle and beautiful. 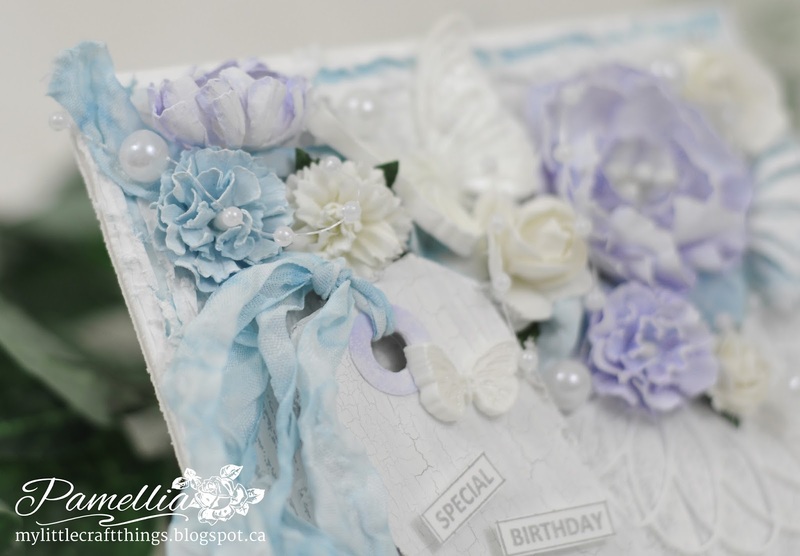 The pretty color palette, pastel blooms, and delicate butterfly are so perfectly shabby chic. I LOVE visiting your blog!! Every time. stop by I am inspired by your art. Your card makes me feel like spring is just around the corner instead of winter!! Scrumptious colours and detailing, Pamellia! Another work of art! Oh my goodness Pamellia this is sooooooooooooooo very beautiful. I love how you did the sentiment on the tag. Your card is so amazingly beautiful. I love it. Another stunner! Great choice for your first hosting post too Pamellia! Gorgeous, so very pretty, I love the soft colours and such a pretty design, love it! Absolutely gorgeous, Pamellia! There's so much detail, and the overall effect is so pretty. I love the subtle glitz on the butterfly and those beautiful flowers! 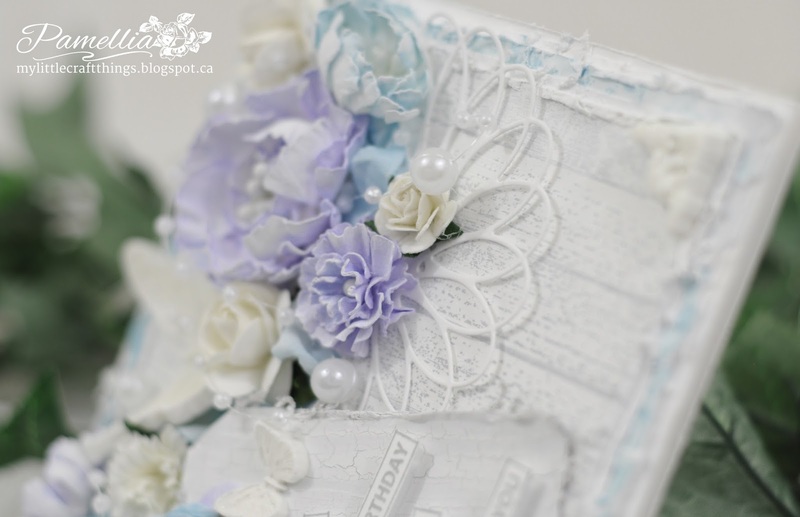 Yummy colors and flowers and distressing! Ohhhh, such an incredible combination of flowers, pearls, ribbon and more!! The butterfly is such a beautiful touch and I love the way you've included a tag for your sentiment. Breathtakingly gorgeous, I cannot believe that you made those flowers, they are stunning and I love the colour. Wonderful backgrounds and really pretty layout. Oh, this is so pretty! Love the distressed edges and soft colours! Thank you so much for playing along with us at Crafty Catz! Shabby-licious! I love your versatility! This is so completely feminine and soft. Wonderful texture...and that butterfly made me say, "ahhhhhh." So gorgeous, I love the colour scheme and those butterflies look beautiful! Another gorgeous creation - for a special occasion. Thanks for playing at Simply Create Too! Absolutely gorgeous as always. Thanks for joining us at Southern Girls Challenge and Congratulations on your win in our texture challenge.